Last week, I wrote the first of what I hope to be a series of articles about Mexico City neighborhoods that I find enchanting. That portrait, about the colonial neighborhood and greater borough of Coyoacán, is similar in theme to my 2014 and 2015 series on Mexico City’s barrios bravos (Tepito, Doctores, etc.). The difference? Coyo isn’t as rough around the edges, and the post was written while wearing a pair of rose-tinted glasses. I am immediately following that Coyo post with my second entry in this new series. Just one stop south from Metro Viveros – where subway passengers exit for Coyoacán – is Metro Miguel Ángel de Quevedo, named after the renowned Mexican architect and environmentalist. Alight here and you’ll see another sculpture of two coyotes in the middle of a traffic roundabout. Turn left, though, and a ten minute walk along the street of the same name leads you through Chimalistac colonia and into Álvaro Obregón delegación, home to the upscale, hilly neighborhood of San Ángel. The green swath of lawn that you come to immediately before reaching Avenida de los Insurgentes (said to be the second-longest urban street in the world, according to Lonely Planet) is Parque de la Bombilla. 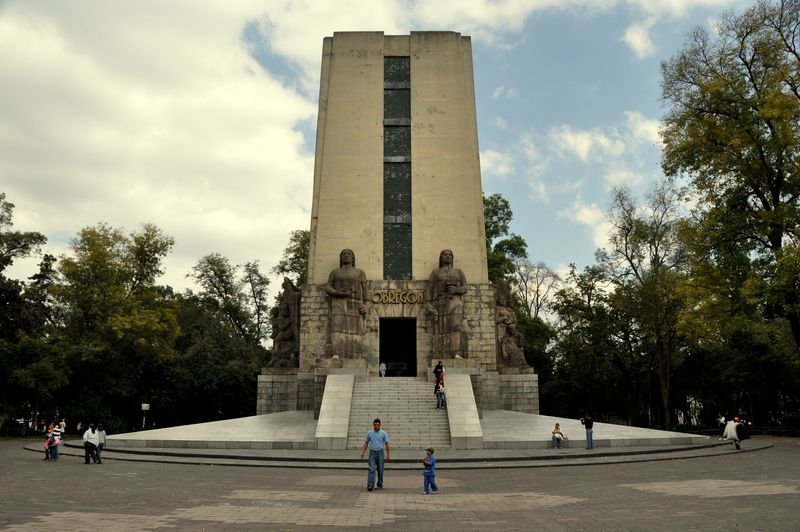 The enormous monument is to post-WWI Mexican President Álvaro Obregón, who is buried here. 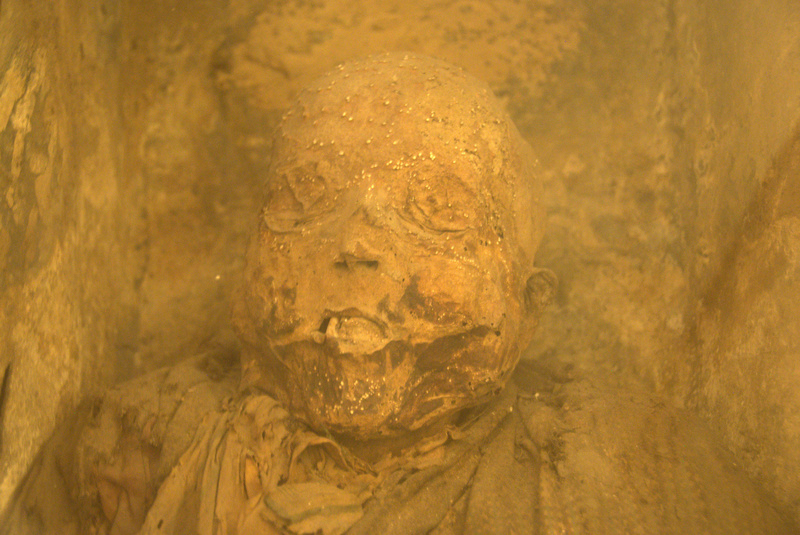 The building itself is only sporadically open, but when it is, you can descend to the lower level and view his hand, severed in battle and embalmed like Han Solo in Jabba’s palace. The Metrobús that traverses Insurgentes in its entirety deserves more than a cursory mention. This electric-powered, articulated bus costs just 6 pesos to ride and connects university students to some of the city’s best nightlife. Immediately across Insurgentes from Parque la Bombilla sits Sanborns Café, owned by Carlos Slim but one of my favorite places for Sunday brunch. The adjacent street, Avenida de la Paz, climbs in earnest and leads you into the heart of San Ángel. The vehicular traffic on this narrow street is something to behold. The semáforo (traffic light) at the top of the street marks its intersection with another busy north-south thoroughfare, Avenida Revolución. There is so much of interest along this stretch of Av. Revolución that it’ll take you two days just to see everything here – especially if, like me, you are an avid museum goer. On the same side of the street but on the other side of Av. 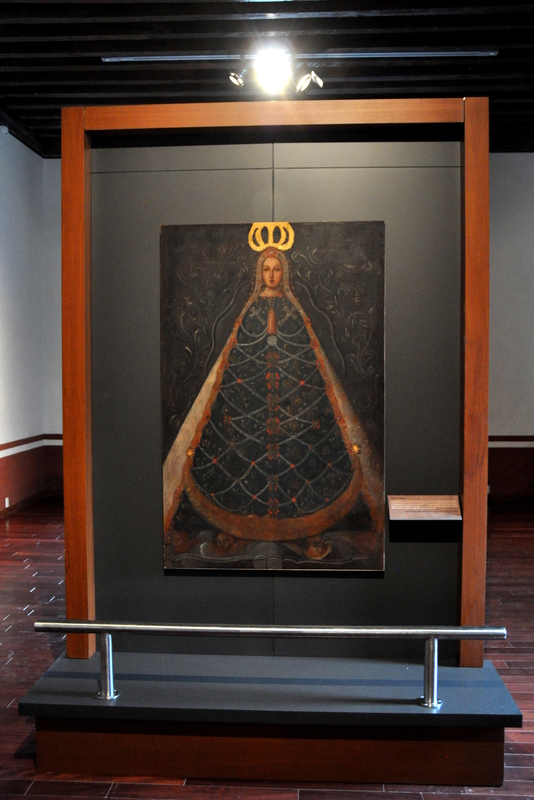 de la Paz and two blocks down, Museo del Arte Carrillo Gil exhibits a small, so-so, and ever-changing collection of contemporary art. I have bought flowers from the 24-hour, street-side floral market that you will pass along the way. 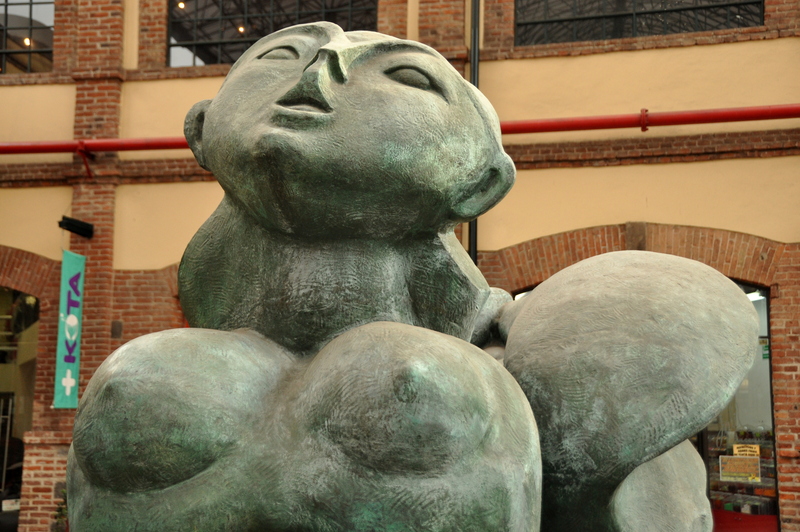 Museo del Arte Carrillo Gil sits near the corner of Revolución and Altavista, and that latter street boasts a shopping mall and several upscale restaurants. Believe it or not, the mile-long stretch of Av. Revolución that passes through San Ángel houses another market, shopping mall, and art museum – all on the west side of the street and the latter two comprising the paper factory-turned-retail complex called Plaza Loreto. The whole open-air mall, not surprisingly, is owned by Carlos Slim and features yet another Sanborns Café. We still haven’t reached the enchanting residential core of San Ángel. A maze of streets, some of them cobblestone, climb from the western side of Revolución. With a few hours to spare, you could explore until your heart’s content. 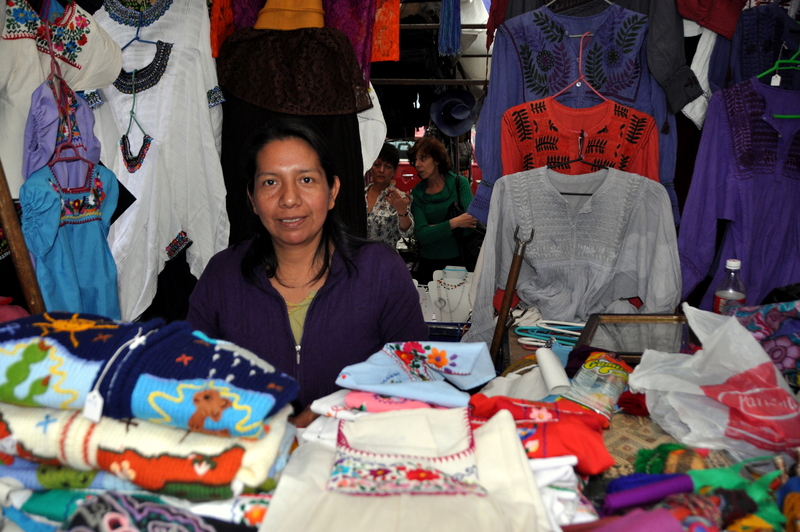 The main drawcard, however, is San Ángel’s famous weekly artists’ market, El Bazar Sábado. 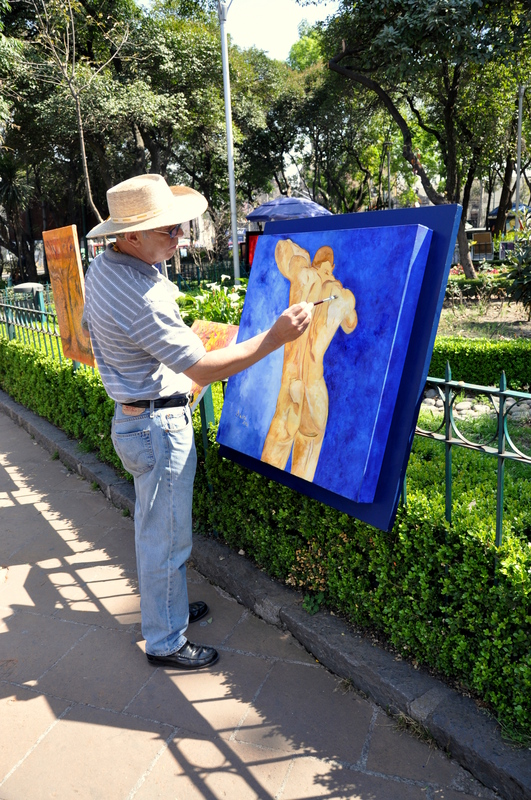 Each Saturday, local artists such as Adalberto Reyes (pictured below) set up their easels and canvases in sloping Plaza del Carmen while locals and tourists browse the offerings. The quality is good, the price is negotiable, and many artists will arrange to meet you at your hotel later if you are traveling by public transport and do not want to carry your purchase back with you. 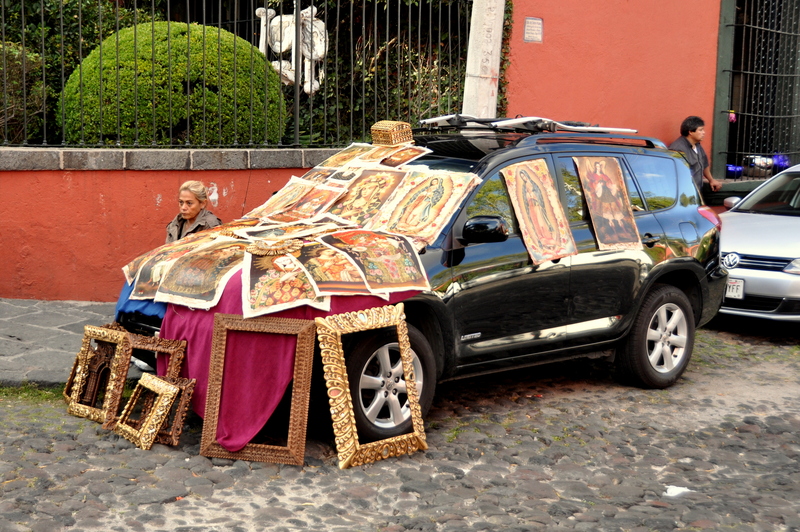 Although art is the name of the game, you’ll find a variety of other trinkets on offer in covered stalls as well. Holiday ornaments, bracelets, T-shirts, you name it. A lovely church, Parroquia de San Jacinto, is named after Saint Hyacinth of Poland and occupies the plaza of the same name, just a stone’s throw from the bustling market area. The church has a façade of gray limestone over pink terra cotta, and I have never not seen a wedding taking place whenever I snuck a peek inside. You may need a street map to get there from the plaza, but you aren’t far from the San Ángel Inn, my favorite restaurant in all of Mexico City. The Inn’s margaritas are the best in the city, and words cannot describe the tortilla soup. Bring a fat wallet. 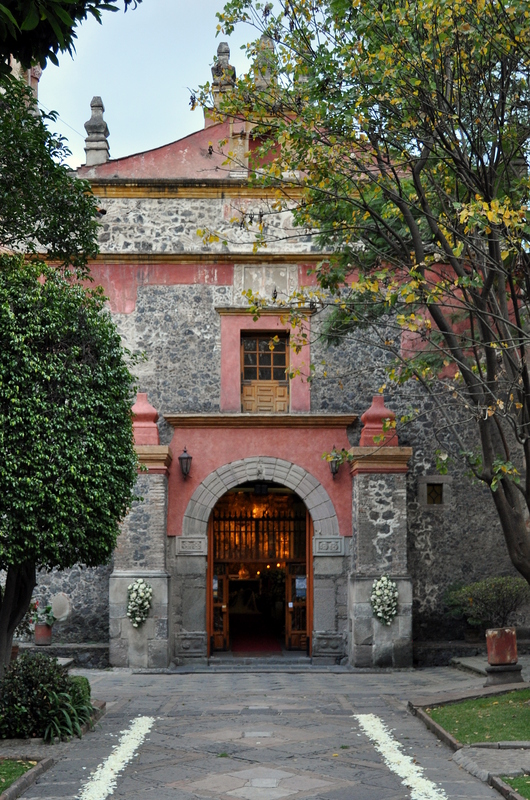 Directly next door to the San Ángel Inn, where Calle Diego Rivera becomes Calle Altavista, sits the unbelievable Museo Casa Estudio Diego Rivera y Frida Kahlo, a pair of side-by-side studio residences. 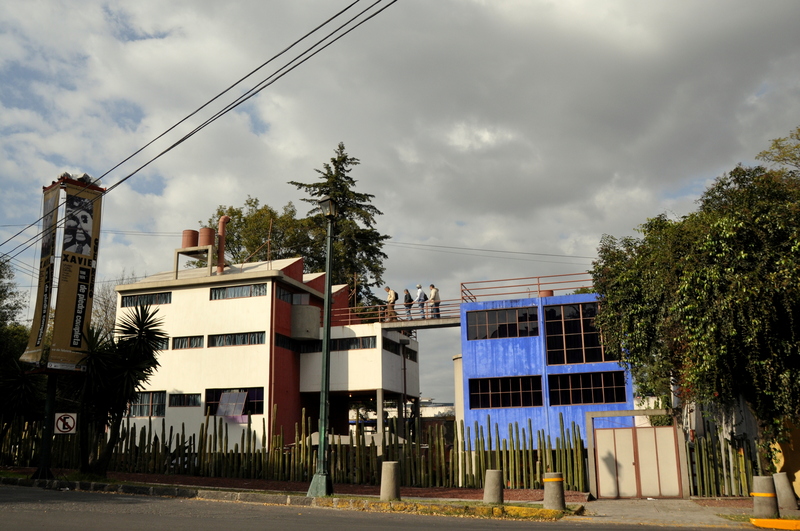 The red-and-white casa housed plus-sized muralist Diego Rivera, while the blue house was where uni-browed surrealist Frida Kahlo hung her proverbial hat. There isn’t much of their art on display, but it is worth the price of admission simply to step inside and traverse the rooftop gangway that connects the two houses. Too much talent and ego by each artist for just a single residence to contain? You decide. A walk down Altavista from Diego and Frida’s dual houses passes a few upscale specialty shops before merging with the aforementioned Av. Revolución. From here, you could double back to Metro Miguel Ángel de Quevedo, via Av. de la Paz, or journey north along Revolución to Metro Barranca del Muerto. Literally meaning “canyon of death” in English, Barranca del Muerto is the southernmost station of Línea 7, which is set deeper underground than any other line and which features a color scheme of deep orange, a clear sign of its early 80’s construction. I am enamored of San Ángel. The neighborhood’s hilly, narrow street are an explorer’s delight, its markets a collector’s dream, its museums a veritable who’s who of art history, its restaurants a gastronomic delight, its people a jovial group of artists, retirees, and young families. A whole weekend spent in San Ángel would not be enough time. Not enough time by half. Thanks for this post. 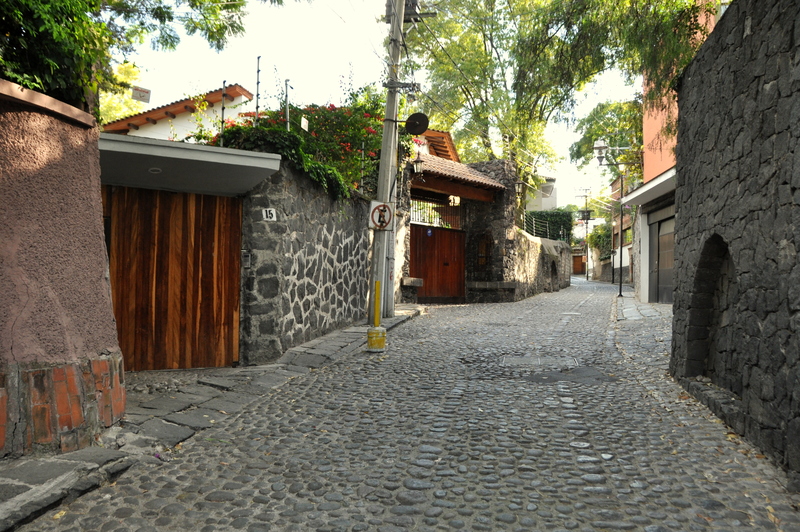 This is another one of my favorite neighborhoods in Mexico City. I have been to most of the places you mentioned. I think that San Ángel is sometimes outshined by Coyo as regards foreign tourism, but it is every bit as nice. Thanks for reading, Bill. That’s crazy! That first picture is like one block away from my great grandparents house.